On the Mac, Copied lives in the menubar, where it can be accessed from any application you happen to be using at the time. Way back in 2009, developer Tapbots released an iPhone app that made it easy to organize, store, and search everything you’ve ever copied to the clipboard. Through what I can only assume was the power of sorcery, Pastebot also worked in tandem with OS X companion software, allowing anything copied on the Mac side to be magically pushed to iOS, and vice-versa. Although iCloud makes such app-to-device interoperability seem like child’s play today, at the time Pastebot was nothing short of a revelation. Sadly, the app was put out to pasture last year and faces an uncertain future, leaving longtime users to hold a candlelight vigil in its absence. That’s why the recent arrival of Copied made me sit up and take notice. Not only has this clipboard manager become one of my most-used apps, it’s pretty much everything I hoped Pastebot might eventually become. Swipe left across any text, link, or image clipping to assign it to a list, share, or delete it on Copied for iOS. Available for Mac and iOS, Copied collects all of the text, links, and images added to the clipboard in one place, using iCloud to sync them across all of your devices. 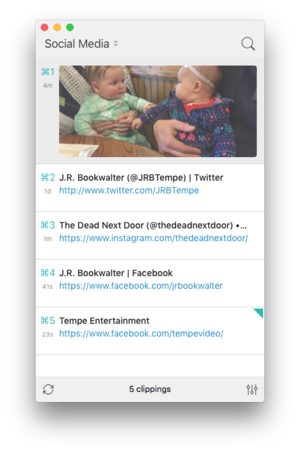 Although the universal iOS app is free, a $2 in-app upgrade is required for sync, as well as conveniently filing and organizing clippings into lists. Mac owners will also want to invest $8 into the OS X version, which will allow clippings and lists created on iOS to be available on the desktop as well. Up to 1,000 items can be manually or automatically saved into Copied’s history, along with an unlimited number in lists. Both apps are capable of lightning-fast search (a trick that also works from Spotlight on iOS), along with templates to purge, alter, or retain formatted text. The Mac version of Copied lives in the menubar, but can be detached as a floating window instead. Keyboard shortcuts provide an easy way to jump between lists, show/hide the app, toggle auto-save, or switch between plain and rich text mode. The row and window height is also somewhat adjustable from Preferences, but there’s no way to resize the panel by dragging the corners. Pasting into any app is a snap using the iOS version of Copied, which includes a keyboard extension. Both versions offer light or dark themes, optional audible feedback when new items are copied, and a setting to ignore duplicate clippings, a great way to keep repetitive entries from showing up more than once. The current clipboard contents are tagged with a slanted blue-green triangle in the upper right corner for easy identification. As handy as Copied is on the Mac, the mobile version is even more convenient, because it helps circumvent some of iOS 9’s lingering deficiencies. Like the late, great Pastebot, Clipboard Sync allows anything saved or copied on one device to be immediately available to others. Copied goes one step further, thanks to optional push notifications which act as a shortcut for opening the app or to clear clipboard contents with a swipe. 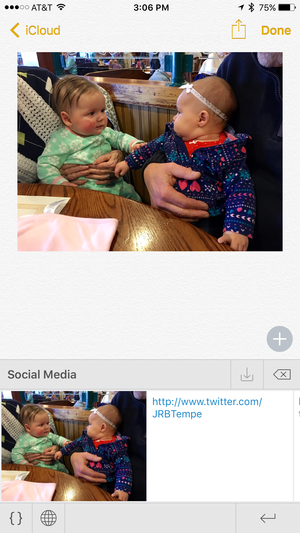 Copied for iOS also includes a Notification Center widget for moving recent items back to the clipboard, launching the app, or deleting clips from Today view. (No such option exists on the Mac, however.) 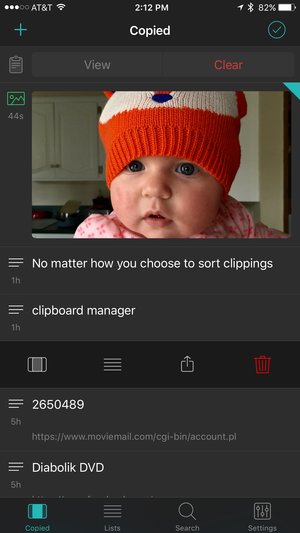 There’s even a keyboard extension for accessing clips from anywhere text can be entered, which has dramatically cut down on the amount of time I spend switching between apps to copy and paste; tapping the top of the keyboard panel cycles through all of your available lists. Lists can include text, links, or images, but not PDFs or document files; clips can be rearranged using drag-and-drop. Inside the iOS app, swiping right across any item moves it back to the clipboard, while a swipe left opens an action panel for assigning the clip to a list, sharing, or removing it. (Sadly, gestures are absent entirely from the Mac version, but contextual menus abound; list items can also be rearranged via drag-and-drop from either app.) iPhone 6 owners can use peek-and-pop to preview individual items, while 3D Touch offers shortcuts to save or view the clipboard, create a new clipping, or search. Although Copied is nearly perfect as-is, there are a few small tweaks I’d love to see. One would be assigning clip names to help identify them easier; although actual content can be edited at any time, there’s no way to create a title or assign color labels. Web links do include titles, but they’re copied straight from the source page and can’t be edited after the fact. There’s also no support for documents or PDFs, which only show up as file names. 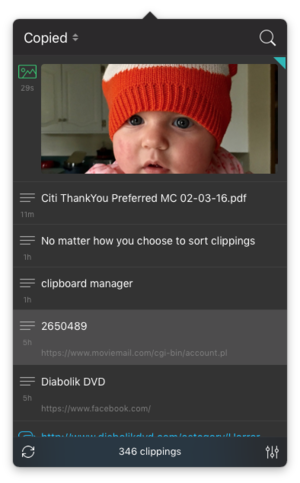 Copied is everything you could want in a clipboard manager, and the iOS version in particular delivers desktop-class functionality to mobile devices.